We all know visiting Disney World isn’t cheap. It’s not a vacation you can get bargain prices for. Sometimes you feel like you’re constantly throwing money around like a rap star. But there is a surprising amount of things to do that don’t cost a lot of money. I wanted to make a master list of things that, not only qualify as cheap (or even free), but are also “off the beaten path” activities. If you’ve visited Disney World often, then you may be looking for different things to do on your next Disney vacation. This list is a great place to start. As a local, I’ve tried most everything and I’ve included some things that I really enjoy doing on a regular basis. Since I’m not on vacation when I’m at Disney, it’s just not practical for me to spend a ton of money every time I visit the parks. So we locals tend to love the challenge of finding things that don’t cost a lot but are still a ton of fun. We also like finding things that not everyone knows about, so we avoid some of the crowds. Disney likes to throw all kinds of options and add-ons in front of you after you’ve booked your trip (and shelled out considerable money already). They may make you feel like you have to add these into your trip. That if you don’t you’ll be stuck wishing you had and watching all the smart people wave as they pass you by on the way to their VIP experience. So let me tell it to you straight. You don’t need all that. All of the entertainment options you get with a standard ticket is still a lot. In fact, there’s no way you’ll do and see everything it will include while you’re here. Heck I live here and still haven’t done it all. So it’s not necessary to add-on those things that cost extra. Things like dessert parties, fireworks cruises, dining plan (unless it’s free!) private tours, after hours parties, and so on. Those things are all fun, but not needed. I see them as better options for trips when you’ve done most things are looking for a new experience to try. But if you’re first timers, or haven’t been in more than a few years, don’t worry with them. Save them for things to do when you’ve been recently and want to try some new experiences. So don’t fall for hype that makes you feel like you have to shell out more money for add-ons. You really don’t. Just experiencing all the rides, shows, and characters in each of the four parks and Disney Springs is plenty. Ok. Getting off my soapbox now. If you haven’t heard of this game let me tell you a little about it. It’s a free game at Magic Kingdom with collectible trading cards. You pick up your starter pack at the firehouse on Main Street or behind the Christmas shop in Liberty Square. The Story: A Villain is trying to take over Magic Kingdom and Merlin needs your help to defeat them. You’ll become Merlin’s apprentice and be given a mission that will start at one of the lands in Magic Kingdom. You’ll go to your assigned “portal” to begin and finishing a mission requires four or five stops around that land. At each stop you’ll scan a card and see an interactive video that continues the story-line. You’ll need to use one of your spell cards to carry on to the next one. There’s a lot of variety in the cards you can use and the reaction you get from the character on the screen. The nice thing is, you have a special “key” card that tracks where you’re at in your story so you can stop and start anytime you’d like, picking right back up where you were. Making it really fun to do in between other things. Kids love it of course, but I know just as many adults that play too. The cards are collectible with special editions coming out during special events at Magic Kingdom. Some of them are highly valuable to collectors. Anyone that’s a gamer will enjoy it and getting to collect the cards makes a great (free!) souvenir. This is a Pirate version of the interactive game like Sorcerers this one is only in Adventureland. If you are a huge Pirate fan then give it a try. Personally, I think Sorcerers is a far better game and more enjoyable to play. You pick this up right across from Tortuga Tavern near Pirates ride. This interactive experience based on Russel from the movie UP is at Animal Kingdom. You’ll be collecting nature badges, similar to Boy or Girls Scouts. There’s nine different spots to pick up your guidebook and begin, including the most popular one to the right just as you enter the Tree of Life area. The map you’re given will highlight the locations (there’s over 30 of them) throughout the park where you will learn a new skill or facts and pick up a new badge. You collect as many as you can. Some do this along the way during their regular park tour, and that works really well. It’s extremely educational which is great for kids, but I love that you talk and interact with so many of the castmembers at each badge stop. They are usually really enjoyable and know so much about the area you’re in that you will definitely learn something new about the park and the animals in it. It’s now been expanded to include Pandora as well. This site has a great detailed article on Wilderness Explorers. This is Epcot’s interactive game through World Showcase. You can sign up at the entrance to World Showcase or at the International Gateway (near the France bridge) where you will receive your mission, and the cell phone that will guide you on your way. Should you choose to accept your mission, you’ll be given the choice of what country you’d like to visit to start. The cell phone will guide you along the way to specific checkpoints – sometimes a statue, sometimes inside a building, and sometimes even to other secret agents disguised as Disney cast members. The way areas of the lands interact are really fun. Like the cuckoo clock in Germany will open up and chime… things that you won’t normally see or notice. This also makes a great activity to keep kids busy while you tour World Showcase at Epcot, however you’ll need to stop and get a new mission after each country you finish. If you haven’t visited some of the Disney World resorts then you’ve got to set aside some time on your next trip. They are so much fun and offer great theming, food and entertainment. You don’t have to be a guest staying there to visit. First let’s discuss parking. You can visit any Disney resort even if you’re not staying there. Just tell the gate guard that you want to look visit and check it out. Here’s the problem. Many people try to park at these and then travel to the parks to save paying the parking fees for Magic Kingdom or Epcot. So because of this, there are some times when these resorts will shut down parking to only resort guests due to higher crowd levels. This is mainly during holiday times. I’ve not had too much trouble with this personally except at Contemporary and Grand Floridian. It can really depend on the day and the person you get. In most cases though, they’ll give you a three-hour parking pass to check out the resort. If this becomes a problem for you, Plan B can be to park at the Ticket Center and monorail to one of the MK resorts from there. Or opt for valet parking which is always available. You can also arrange to stop by these when you’re coming back from a park. For MK just take the Resort monorail instead of the Express. From Epcot just exit the back way near France and take the boat to any of the Epcot resorts. My favorite Disney World Resort because there’s so much to see and enjoy. It also has some of the very best food in all of Disney. Torch Lighting Ceremony – This is one of those little things people don’t always know about. While not worth a special stop it makes a great add-on if you’re in the area. Every evening at 6pm they perform a traditional ceremony for the lighting of the torches. It’s performed by some of the amazing fire dancers that are in the luau each night. But you can see them here for free. Have a Drink at Traders Sam’s – This little bar is tucked away on the downstairs of the Polynesian. Ask a CM if you can’t find it. It’s small and only holds a certain amount of people. It’s themed so cool and there are signature drinks that involve the servers performing certain rituals (like serving you your drink like they’re a zombie) or the whole bar reacts with dimming lights and a storm outside the “windows”. It’s such a fun atmosphere – trust me. Just go. You’ll love it. Watch the Electrical Light Pageant – This little light up boat show can be seen on the Polynesian Beach nightly around 9pm. It’s been around for 30+ years and is a longtime favorite. Get a Dole Whip – The only place (as of this writing) to get the Pineapple swirl (Pineapple soft serve ice cream swirled with vanilla) is at the Polynesian. Grab one and take it out on the beach when you watch the fireworks. Along with some of the same things like watching the Fireworks, and the Electrical Pageant, Grand Floridian has their own unique entertainment each day. Princess Promenade is when Disney Royalty (usually Cinderella and her Prince) descend the Grand Staircase and dance together. Young ones are encouraged to join them. It’s technically a Magic Moment meaning it’s not guaranteed to happen. But typically it happens everyday except Tuesday at 3:30 in the main lobby. Definitely more fun at night, the Boardwalk area surrounds the Boardwalk Resort and the Beach and Yacht Clubs. They’re all connected by walking paths and boats that also connect the back entrance to Epcot near France. Boardwalk is done in a Coney Island theme, and features nightly outdoor entertainers, a great bar, and a wonderful ice cream shop. Watch the Entertainment – an assortment of live entertainers who perform 6:30 – 10:30 p.m. Thursday-Saturdays outdoors on the BoardWalk. From jugglers to magicians and strolling musicians! Get some Ice Cream at Ample Hills – Considered by many to be the best ice cream at Disney World. They do make it all by hand on site and some of their flavors are pretty magical like Ooey Gooey Butter Cake. Definitely stop by and give it a try while you check out Boardwalk. Grab a Drink at AbracadaBAR – This bar is themed around Houdini era magicians and fit perfectly with the time period of Boardwalk as a whole. Fun themed drinks and cozy decor make it feel more like a speakeasy. You’ll love the theming and the castmembers. 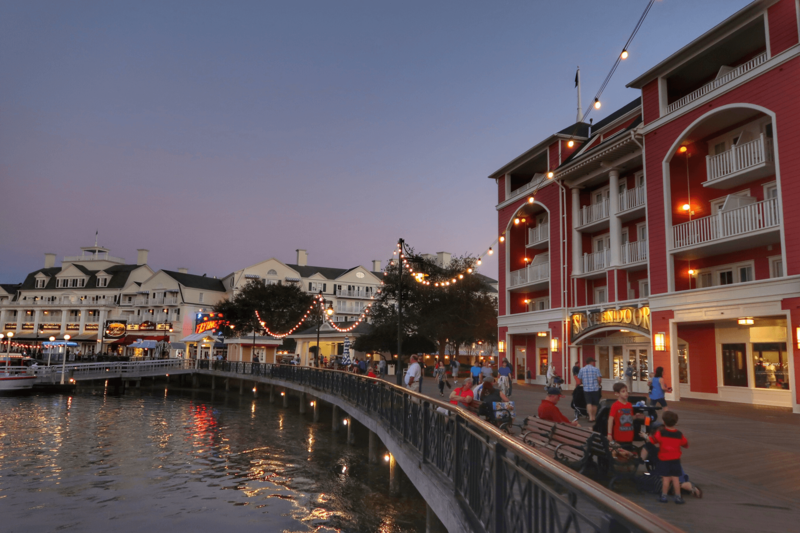 Port Orleans is right near Disney Springs and if you want to combine your visit then add it in on a day you’ll be at Springs and take the boat over to Port Orleans from any of the Disney Springs boat launches. This lively piano entertainer is one of the best kept secrets at Disney World. His interactive show is a hit with all ages. You can catch him at River Roost Lounge most Wednesday-Saturday nights, and it lasts about 1.5-2 hours. Like any “live music in a bar” sort of gig, you can come and go as you please. Just don’t expect to go very quickly; once Bob gets going, you won’t want to leave. Have I missed any? Drop me a message and let me know. I’ll add to this list as I get suggestions.